Labour's lovable, rotund rhetoritician of bamboozling bureaucratese has been unwell for some time - as I understand it - and has not been practising his confounding oratory at the usual places you would expect to see him (and, no I don't mean Bellamys). Looks like things may have taken an unfavourable turn and the pie jokes will have to go back in the warmer for the present time. Labour MP Parekura Horomia is seriously ill and resting at home with his family. The Ikaroa Rawhiti MP, 62, is understood to have been unwell for some time, but the cause is not known. His family issued a statement today requesting privacy and saying he was at his Mangatuna home convalescing. "The whanau of Hon. Parekura Horomia is very humbled by all the love, support and kind wishes for their grandfather, father, brother and uncle." A spokesman for Labour said the party was aware of the family's statement "and wish him well at this time." Mr Parekura was first elected as the MP for Ikaroa Rawhiti in 1999 and is regarded as Labour's 'kaumatua' in Parliament, respected for his widespread links to Maoridom. 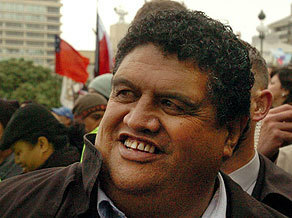 He was Minister for Maori Affairs between 2002 and 2008. Not one bad word has been said about Parekura Horomia - which is ironic given how many words of any description Horomia was capable of saying on any topic. Some would say he is a wordsmith, others, just wordy. Regardless of what people may think of the substance or the delivery he is one of parliament's characters and for all his verbosity is one of its best speakers. The illness means a by-election is virtually certain. Labour will be sounding out candidates and running through scenarios. David Shearer hinted there was some hope of a good Labour candidate to take over from Parekura, so it may be someone parachuted in from left-field. Depending on the candidate of course, Mana should be the main rival to Labour in this seat however, not the hopelessly divided and dwindling Maori Party. I was at the Mana AGM a few weeks ago but can't recall what was lined up for the electorate. It was an issue though - Horomia's illness and the ramifications were well known for some time. Tawhai McClutchie did not do as well as hoped so I'm not sure his chances are that hot. Mana's East Coast general electorate candidate, Val Irwin, is a better prospect from what I've seen: he's a good communicator in both languages, has whanau connections on that coast and has an interesting back story as a local film star in the 60s. Annette Sykes, Mana president and Waiariki candidate (who ran Te Ururoa Flavell to within 1,900 votes at the least election) is the big gun however should she decide to enter. There may be quite a few people chancing their arm when a by-election is on offer so it is rather early to speculate. Horomia leaves big gumboots to fill. He retains strong popularity despite challenges. Derek Fox (running for the Maori Party) came the closest to toppling him in 2008 cutting him to a 1,645 majority. Parekura passed away yesterday afternoon - just shortly after this post was written. Many have said fond things of him. RIP Parekura Horomia. What about Mereama Pitman for Mana? Surely she would be a strong candidate.